Move into OTT market is expected to be completed by the end of 2019. 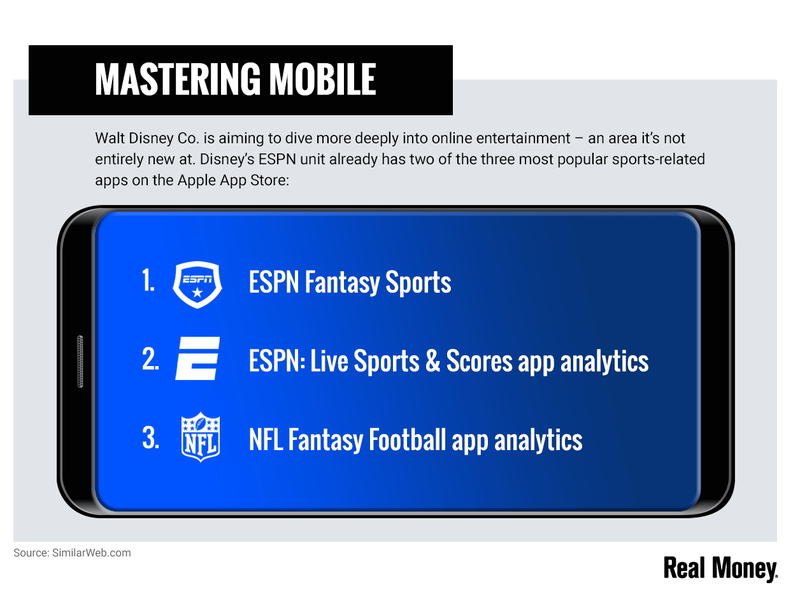 The Walt Disney Co. (DIS - Get Report) is diving into digital as it targets Netflix's (NFLX - Get Report) domain of streaming services and apps. The move to the OTT market, to be completed by the close of 2019, will leverage Disney's existing media content such as Pixar, Marvel, Disney, Lucasfilm, ESPN, as well as assets to be acquired as part of the planned Twenty-First Century Fox (FOXA deal. "Regarding Netflix and our strategy regarding the apps,... we will be launching the Disney app into the market probably in about ... a year, sometime [at] the end of calendar 2019," CEO Bob Iger said during the company's Aug. 7 earnings presentation. The new app that Disney will produce by the end of next year will be a quality content-focused initiative, rather than a pure volume play Iger made clear, shying away from competing for volume production with Netflix's massive catalog. "For this content we feel that it does not have to have anything close to the volume of what Netflix has because of the value of the brands and the specific value of the programs that will be included on it," he said. "That's not in any way suggesting that Netflix isn't in the quality game. There's a lot of quality there, but they're also in the high-volume game." Iger said the price of the app will reflect the smaller amount of content compared to Netflix. However, the company might be able to cut into Netflix's volume dominance, as it will be unencumbered by obligations to list Disney titles on Netflix next year. So far, the movie and media giant has experience in the space with its its ESPN+ streaming service and its ESPN app (a top-ranked sports application on Apple's (AAPL - Get Report) App Store). The company will also own 60% of Hulu, the second most popular entertainment app for iPhone users, at the close of the Fox deal. According to a 10-Q filing released Tuesday, the Trifecta Stocks name currently holds a 30% ownership interest. However, Iger was quick to quell suspicion that all of these entities would be spun into one, aggregated app. "We don't really want to go to market with an aggregation play that replicates the multi-channel environment that exists today because we feel consumers are more interested in essentially making decisions on their own in terms of what kind of packages that they want," Iger explained. Instead, the OTT play will be divided into three categories aimed at specific audience demographics; these being sports streaming through the ESPN app and ESPN+, Disney, and Hulu. 2019 will be a pivotal year for the initiative, as Iger said the launch into direct-to-consumer products will be "the biggest priority for the company during calendar year 2019."